This article first appeared in the Fall 2013 Issue of The Journal of Air Traffic Control. To download a PDF of the full article, click here. Blanche Noyes – competing in her first cross-country air race in 1929 – noticed smoke seeping in from the baggage compartment, rapidly filling her plane. From little more than 3,000 feet above the wide plains of West Texas, with no time to search for a good landing place, she brought the plane down quickly, crashing through bushes. Noyes leaped out and threw sand on the plane, scorching her fingers. After putting out the fire and repairing the damage, Noyes finished fourth in the Women’s Air Derby “heavy” class, just behind Amelia Earhart in third. Noyes’ forced landing exposed her to gaps in aviation safety and navigation. But it would take another, far worse crash for the pioneering aviatrix to act on her concerns. In time, Noyes made life-saving changes in aviation as president of the Ninety-Nines, an international organization of women pilots, and the head of a federal effort to improve air navigation. Noyes was born Blanche Wilcox on June 23, 1900, in Cleveland, Ohio. As a child, she wanted to be an actress. She followed that dream, appearing in numerous Broadway plays and starring in the Pittsburgh run of “White Cargo” in 1927. While Noyes loved being an actress, she was destined for a leading role on a stage new to the 20th century. 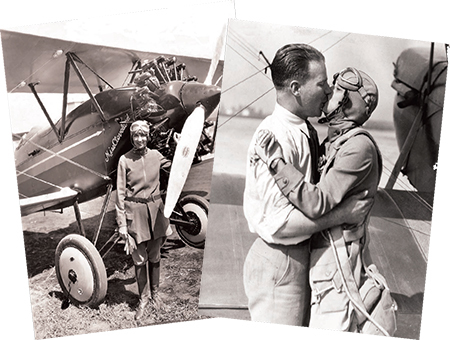 Noyes’ desires shifted soon after meeting a handsome young pioneering airmail pilot named Dewey Noyes at a Pittsburgh dinner party honoring Charles Lindbergh soon after his famous trans-Atlantic flight. Dewey Noyes and the woman who would become his wife talked that night for hours about aviation. The pilot and the actress married in 1928. “Dewey didn’t have any difficulty persuading me to give up the theater and movies, for when a girl falls in love, that’s it,” Noyes told the Pittsburgh Post-Gazette in 1962.
wife her first airplane with the intention of teaching her how to fly. According to a 1980 article in the FAA Aviation News Journal, Dewey stirred up an argument with Blanche by telling her flying was so easy “even a silly woman could learn.” With Blanche arguing how difficult it must be, her husband shoved her into the cockpit, and in less than four hours she was flying solo. Within months, Noyes joined 18 other competitors and flew in the legendary race that almost killed her. Noyes’ husband wasn’t as lucky. Dewey Noyes was flying over Nunda, N.Y., in early December 1935 when he hit a sudden ice storm. Ice coated the wings and windows of his Beechcraft Staggerwing. The crash was fatal. Out of her grief, Noyes wanted to improve safety for other pilots. Within a year after her husband’s death, Noyes took a pilot’s job with the federal Bureau of Air Commerce’s National Air Marking Program. The same year, she joined Louise Thaden in the cockpit to become the first women to win the Bendix Transcontinental Air Race. “The credit should go to my husband,” Noyes told reporters after the race. Air marking was an important navigational advance. In the earliest days of aviation, pilots could easily become lost and confused looking for landmarks to tell them where they were. Pilots often followed railroad tracks and roads to get from town to town. Noyes’ government job was to travel and train others to paint town and airport names, directional arrows, mileage, and, later, latitude and longitude on rooftops and anywhere else a pilot could see the air markings. She and her colleagues saw to the painting of 13,000 air markers before World War II. But after the Japanese aerial attack on Pearl Harbor in 1941, the Civil Aeronautics Administration (CAA) feared air makings could potentially aid enemy pilots. The CAA mandated the obliteration of all air markings the enemy could plausibly use to their advantage. It took nearly a month to cover up all but about 3,500 markings outside of defense zones. During the war, Noyes flew to inspect the markings that remained. At the end of the war, Noyes was selected by the CAA to head the air marking division. For many years, she was the only female pilot allowed to fly U.S. government aircraft, helping to make the skyways as easy to navigate as highways. By 1962, more than 45,000 air markings could be seen by pilots. “The skyway has taken hold of the public imagination and the need for air marking at last is becoming apparent to everyone,” Noyes told Flying Magazine in January 1948. From 1948 to 1950, she also served as president of the Ninety-Nines, which had been involved in air marking from the beginning. To this day, they still perform the volunteer service of painting markings for pilots that can be seen from the air. Noyes retired from the FAA January 1, 1972, but continued to fly. Noyes was inducted into the Aviation Hall of Fame in 1970. 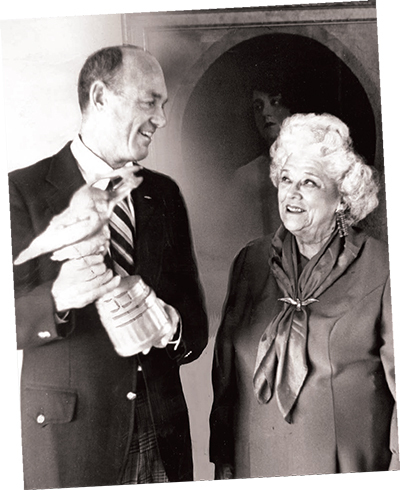 Among her awards, medals, trophies, and cups, she was named woman of the year in aviation for 1954 and received a gold medal from the secretary of Commerce in 1956 for her air marking work. Blanche Noyes died October 6, 1981, in Washington, D.C., leaving a legacy that continues to safely guide pilots home. Interested in subscribing to or writing for The Journal of Air Traffic Control? It’s included in each ATCA membership! Click here to see the submission requirements and deadlines.